Comfortable way to reach Jomsom by short duration flight: There is every morning flight from Pokhara to Jomsom and return. It is only 15 minutes flight with tiny aircraft. It is one of the remote area flights if Nepal and weather conditions is really depend on flight. From Kathmandu, one can reach to Pokhara with road transport or by fight to catch next day morning flight to Jomsom. Private jeep drive from Kathmandu or from Pokhara: Road to Jomsom from Kathmandu is about 360 kilometer and about 157 kilometer from Pokhara. After beni, entire road up to Jomsom is rough and 4wheel jeep drive is require to reach Jomsom. Pokhara to Jomsom road leads to Muktinath and Upper Mustang till Nepal Tibet boarder Korola. Private jeep takes a whole day drive from Pokhara to Jomsom one way, from Kathmandu one night two days only one way. There are no any shared jeep facility drives to Jomsom either from Kathmandu or from Pokhara. Direct local bus from Kathmandu or from Pokhara to Jomsom: Local bus service to Jomsom from Kathmandu is started. There is daily local bus from Gongabu bus station Kathmandu. It is night bus starts between 2 to 3 pm. Bus fair is 1,600 Nepali rupees if you buy it direct from ticket counter. Next day morning at around 8 to 9 am, you will reach at Jomsom. Daily local bus service from Pokhara to Jomsom is also in operation. It leaves at morning time at around 7:30 am and reach Jomsom at evening. Bus ticket cost one thousand Nepali rupees if you buy it direct from ticket counter. Trekking to Jomsom: Jomsom is famous trekking destination of Mustang area. Lower Mustang area covers Muktinath, Jomsom, Kagbeni, Marpha, Tatopani, Kalopani and Beni. Entire lower mustang route is connected with rough toad, still can trek for a week plan next to road. 2/3 days hiking plan also can be customize. There are many villages near Jomsom which is real typical to explore. Marpha villages near Jomsom, Kagbeni village next to Jomsom, Lubra vilalge, Luri village way to Upper Mustang, Kobang, Jharkot ect. There are local tea houses as accommodation in entire trekking. Trekking reach at maximum altitude of 3,800 miters Muktinath. Hotels and guest houses in Jomsom: There are similar category local guest houses in Jomsom. About 20 tourist based guest houses are similar categories. A simple tea houses are also available for low ranges. Deluxe hotel at the top of Jomsom is also available. Costs of the hotel rooms are depend on category. Normally 300 Nepali rupees till 2500 Nepali rupees for one room. Good breakfast, Lunch and Dinner are available in every guest houses. You can choose international foods from their menu list. 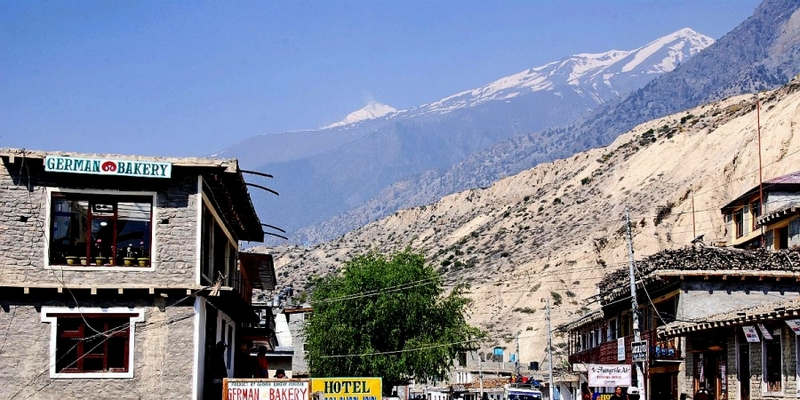 Major place to visit in Jomsom: The main attraction of Jomsom is Himalaya view, local houses, local market, small airport at bank of Kaligandaki, Jomsom terrain, Mustang Eco museum and Kagchode Thubten Sampheling Gompa. Hike upper part of Jomsom is to view bird eye view of Jomsom airport during plane landing. Attraction nearby Jomsom: Marpha village is more typical villages nearby Jomsom. It is 2 kilometer from here takes 30 minutes walking or uses local transportation. Kagbeni village is another typical mustang village nearby Jomsom can walk for 3 hours or drive about half an hour. Famous Muktinath temple is 25 kilometer drive from Jomsom. Road condition to reach Jomsom: Kathmandu to Pokhara is drining through main highway. It is well paved road. Road between Pokhara to Beni about 100 kilometer is also well paved highway. From beni to Jomsom about 67 kilometer is all rough mountain road. Jeep drive or big wheeler other vehicle are able to reach Jomsom. Further road to Kagbeni is also rough but Kagbeni to Muktinath is recently black topped. Jomsom is gateway of Muktinath temple and Upper Mustang region. When you land at Jomsom airport, you will drive or trek to Muktinath from here. It is 3 hours drive with local sharing jeep to Muktinath temple. You can plan single day tour to Muktinath. From Pokhara, land at Jomsom at early morning flight than to drive Muktinat temple. Drive back to Jomsom for overnight after visiting Muktinath temple and surroundings. Next morning fly back to Pokhara. Most of our Muktiath Tour does fly to and from Jomsom. More percentage trekkers who trek to Upper Mustang also get fly to Jomsom and trek to Upper Mustang. Again fly back to Pokhara after their trek. After adventure Annapurna circuit trekking, most of the trekkers plan to end their trek in Jomsom and fly back to Pokhara.